Endangered is a dance performance inspired by the theory of evolution — the origin of the large variation found in the biological world. The work premiered at Atalante in Gothenburg, Sweden, in May 2012. 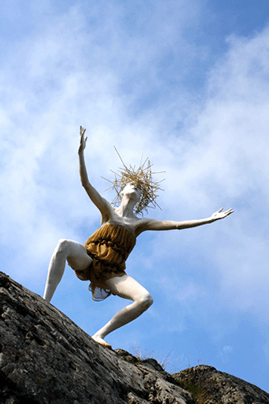 In Endangered the Butoh choreographer Frauke creates a powerful dance that touches the spectator to the bone. Endangered consists of six living scenes in the solo format. The costumes have an integral role in the choreography. They are the amazing creations of Matilda Larsson: Birds nests covering Frauke’s breasts, a ghostly tent of resurrected limbs or a red dress–all capable of concealing what is up or down. But they are never spectacular just for the sake of being so. What could easily have become six beautiful pearls on a string comes together as a mighty whole, where Henrik Åström’s music, Viktor Wendins lighting design and Åsa Thureborn’s set design bear equal weight amplifying Frauke’s choreography. The light and music also binds together the images and gives us time to reflect. The Endangered team has studied bones and archaeology, looking for something beyond the time we live in. But there is no history to understand here, just a deep experience to take in. Many visual artists are approaching dance today. Frauke is rather the other way, she lets her dance control the visual world. Maybe the two are one and the same for her. The dance consists of slow movement. Every gesture is carved out so that the human body is distanced and becomes something else–something thin and delicate, but with extremely high density. The transformation belongs to the alluring magic of Butoh.